The tropical severe cyclone, Helen, made a landfall on the Andhra Pradesh coast close Machillipatnam around 1.30 pm today. According to the preliminary report, 10 persons are feared to have lost lives in cyclone-related incidents. They include one block development officer from West Godavari district. Large-scale crop damage has been reported from Prakasam, Guntur, Krishna and West and East Godavari districts, especially from West and East Godavari districts. The cyclone winds had a speed of 120 km/hr at the time of landfall. Coastal areas started experiencing heavy rains and strong winds around 11 am. The sea became very turbulent and waves rose more than 1.5 m high. A large number of houses have suffered damage and many big trees got uprooted. Evacuation of the people from the coast to safer places was started in the morning itself. More than 20,000 people have been evacuated from Krishna, Guntur and East and West Godavari districts to safer places. Fishers have been strictly warned not to venture into the sea today and tomorrow since the sea will be very rough. Many low-lying areas in the coastal distrcts are under water. Relief work is in progress. Six teams of the National Disaster Response Force and about 450 personnel of the State Disaster Management Force are engaged in the relief work. According to the India Meteorological Department, the Cyclone will retain its intensity six more hours after he landfall and the intensity will gradually subside. Heavy rains under the effect of the cyclone will continue tomorrow also. Last month the state had experienced tremendous damage. 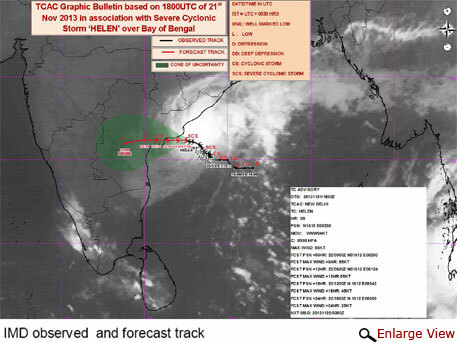 including crop loss when Phalin, a severe cyclone, hit the east coast at Gopalpur in Odisha close to Andhra’s north-eastern district of Srikakulam. Many low-lying areas in the coastal districts were under water for many days in the floods and heavy rains that followed Phailin. A central team has just concluded damage assessment on November 20. With the threat of heavy rains and large-scale inundation of low-lying areas, the state government had put the administration of three districts on alert. While evacuation of people of low-lying and vulnerable areas in the districts likely to be affected has begun, the collectors had been asked to warn people about possible flash floods in streams and rivulets. Revenue minister N Raghuveera Reddy, had a video-conference on Thursday with the district collectors to review the preparedness for the impending disaster. The Krishna district administration has kept four relief teams ready in three coastal blocks. About 130 relief camps have been opened. Officers in-charge have been appointed to oversee the relief work before and after the cyclone,” said Krishna district collector Raghunandan Rao. Six teams of the National Disaster Response Force are in position for the relief work. The state government has requested for more teams from the Centre. About 450 personnel of the State Disaster Management Force would also be available to help in evacuation and relief work, said the commissioner of the state disaster management department. One helicopter has also been kept ready for lifting people from Machillipatnam, Amalapuram and Narsapurram areas.